To challenge the members of the University to examine their social responsibilities in the light of the Christian faith. To develop the awareness of all the members of the academic community of problems and issues that abound in the country today. It encourages members of the University to analyze these problems and to come up with appropriate recommendations and plans of action. To challenge members of the academic community to share their skills and resources in providing assistance to outside groups, especially to those from the lower-income strata. Weeks after the typhoon Ondoy (Ketsane) brought rain and inundated with floods many areas in Metro Manila and nearby provinces (Rizal, Laguna, and Bulacan), the situation on-ground remains challenging. As of October 8, 2009, the National Disaster Coordinating Council (NDCC) has pegged the total damage caused by Ondoy at PhP 9.7 billion. Lives were also lost. A total of 298 people were killed, 5 injured, and 39 missing. The NDCC has also claimed that about 829,498 families or 4 million people have been affected by the typhoon. Of this, more than 100,000 families are still requesting for assistance. 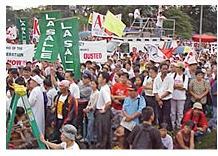 On September 28, two days after the devastating typhoon wrought havoc to the lives of many Filipinos, De La Salle University (DLSU) started relief operations via project “Sagip Metro (Save Metro),” jointly organized by DLSU’s Center for Social Concern and Action (COSCA), Student Council (SC), and the Office of the President and Chancellor. Students, faculty members, staff, parents, and alumni have shown their support for the relief drive by serving as volunteers, donating goods and money, offering vehicles for the relief distribution, asking network and partner organizations for donations and reporting situations of other Lasallians who need special assistance or intervention. The SDRC emerged from an enduring effort to help create a university environment conducive and rewarding to research. Especially in recent years, much of the research projects have focused on such areas as public health, poverty reduction, and sustainable agriculture. The SDRC works with communities, as well as government and non-government institutions, to promote a greater participatory strategies to address social concerns. The Formation Program is designed to deepen the social orientation and hone the skills and talents of volunteers. The program offers various special projects and volunteer activities which encourage the active participation of the Lasallian Community. Additionally, it aims to offer training that produces socially and politically aware, responsible and active Lasallians who can contribute in nation building. The Tredtwo Program focuses on applying Catholic Social Justice teaching focusing on issues of the poor and marginalized. The program aims to provide students with a lens on which to view social realities and a framework to guide collective and positive action to address social issues. Students enrolled in this program are required to render direct service to at-risk youth, the elderly, the sick, and prison inmates, and also to work for animal welfare and the environment. The program aims to strengthen partnership between university and local government unit of the municipality of Lian for conservation and sustainable utilization of natural resources. It aims to collectively determine the status of the resource base, identify management options for rehabilitation and protection and implement these using a variety of methods including establishment of a marine protected area, institutionalization of relevant legal instruments and environmental education. The program’s core strategy is community organizing.